Class 4.3: Lunt Fort Lunacy! Salve! (that's Latin for hello). For topic this term we are learning all about the Rotten Romans. To learn more, today we visited a real life Roman fort (Lunt Fort). We had a brilliant day and learned loads too. Have a look at some of the things we got up to. Our super adventure back through time began when we were greeted at the gates of the fort by two Roman soldiers who demanded a password before we could enter (shhh! It was sausages, or in Latin, tomacula). We then learned all about how the Romans came to Britain and made forts.. and how they protected them from the Celts! Arrows like this were fired up to 50ft away by a machine called "The Scorpion"
high enough so they could see invaders from a distance! These deep ditches dug around the fort would be a trap for any charging invaders! 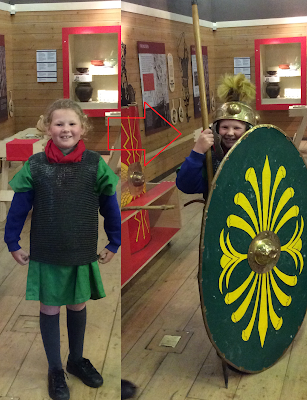 We also learned all about how the Roman soldiers lived. Courtney was disgusted with the idea of communal toilets! *retch*..they also had to share their bottom wiping sponges! No wonder Courtney is appalled! "Oooohh... Money money money! ££££££"
This big ring called the "gyrus" was used to train horses. It's the only reconstructed gyrus in the world! We were super lucky to see it! Look how tiny we look. The gyrus was 34m in diameter! It was huge! Spotted: Sleeping on the job! Report to commanding officer! Shenae was just dying to get her hands on her own pair of swanky Roman sandles! "Hmmmm. I wonder if I can buy these from New Look?" Tegan shocked us all with her transformation. From sweet and innocent school girl to fierce Roman warrior! .. we did some Roman marching. Don't forget to have a look in the gallery here (Lunt Fort Photo Gallery) to see all our fabulous photos. That's all for now. Stay tuned for some more 4.3 adventures. Oh my goodness ( even though it was a rainy day) what fun you all had!! You're right Miss Madden, it was a fab day indeed!